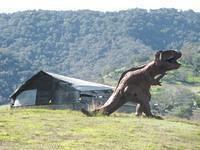 There are so many dinosaurs in California, they got their own section on our website! We have the colossal Cabazon Dinosaurs, countless metal dinosaurs roaming our hills, and even some dilapidated concrete dinosaurs down east of Los Angeles. And if that wasn't enough Dixie the Dinosaur formerly of Benecia and Dixon use to shill for cigarettes!